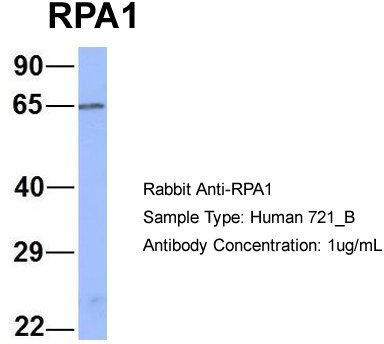 RPA70 (HSSB, REPA1, RF-A, RP-A, p70) is a component of a heterotrimeric complex, composed of 70, 32/30 and 14 kDa subunits, collectively known as RPA. RPA is a single stranded D binding protein, whose D binding activity is believed to reside entirely in the 70 kDa subunit. The complex is required for almost all aspects of cellular D metabolism such as D replication, recombition, cell cycle and D damage checkpoints, and all major types of D repair including nucleotide excision, base excision, mismatch and double-strand break repairs. 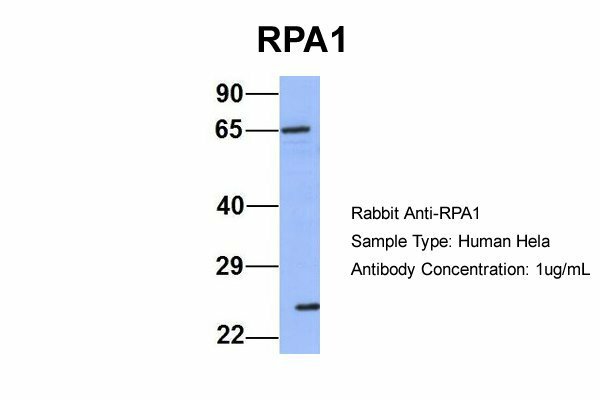 In response to genotoxic stress in eukaryotic cells, RPA has been shown to associate with the Rad9/Rad1/Hus1 checkpoint complex. RPA is hyperphosphorylated upon D damage or replication stress by checkpoint kises including ataxia telangiectasia mutated (ATM), ATM and Rad3-related (ATR), and D-dependent protein kise (D-PK). Hyperphosphorylation may alter RPA-D and RPA-protein interactions. 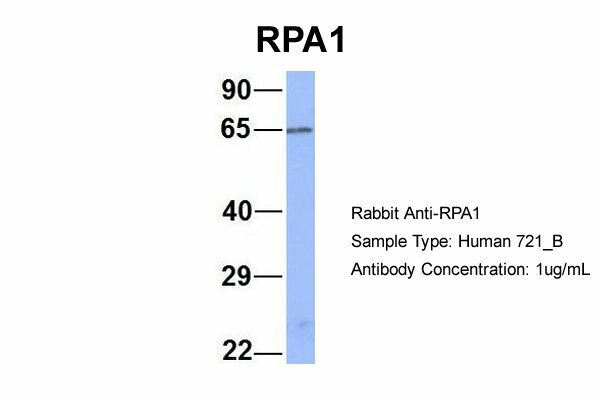 In addition to the checkpoint partners, RPA interacts with a wide variety of protein partners, including proteins required for normal replication such as RCF, PC and Pol a, and also proteins involved in SV40 replication, such as D polymerase I and SV40 large T antigen . 1. Mol Cell. 2009 Oct 23;36(2):193-206. J Biol Chem. 2009 Dec 11;284(50):34682-91. 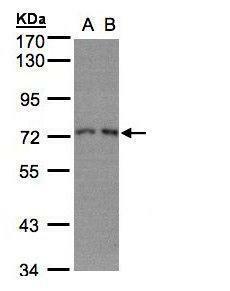 RPA1 polyclonal antibody (A01), Lot # 050727JC01 Western Blot analysis of RPA1 expression in Y-79 ( Cat # L042V1 ). 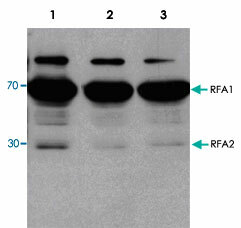 TCA precipitated protein extracts from a wild type yeast strain ( S. cerevisiae ) were separated on 10% gel and transferred to a PVDF membrane.RFA1/RFA2/RFA3 polyclonal antibody ( Cat # PAB13584 ) was used in different dilutions : 1 : 5,000 ( Lane 1 ), 1 : 10,000 ( Lane 2 ) and 1 : 20,000 ( Lane 3 ).Besides the bands for RFA1 and RFA2 an unspecific band was detected at ~150 kDa. 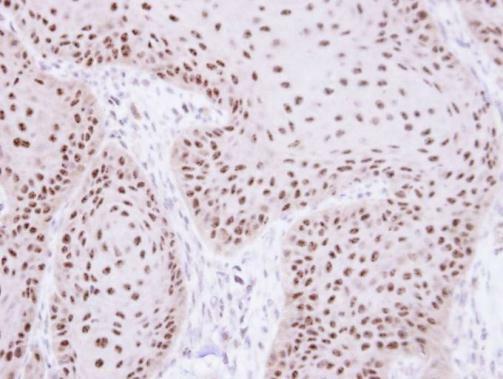 Immunohistochemical analysis of paraffin-embedded prostate tissues (left) and colon cancer tissues (right) using RPA1 antibody Cat.-No AM06744PU-N with DAB staining. Immunofluorescence analysis of HeLa cells using RPA1 antibody Cat.-No AM06744PU-N (green). Red: Actin filaments have been labeled with Alexa Fluor-555 phalloidin. 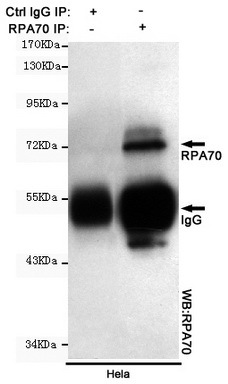 Left: Western blot analysis using RPA1 mAb against human RPA1 (AA: 308-513) recombinant protein (Expected MW is 48.3 kDa). 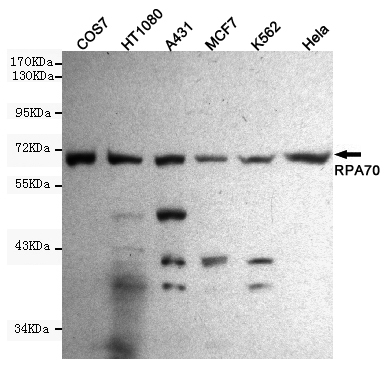 Right: Western blot analysis using RPA1 mouse mAb against HeLa (1), MCF-7 (2), K562(3), A431(4), and COS-7 (6) cell lysate. Flow Cytometric analysis of Jurkat cells using RPA1 antibody Cat.-No AM06744PU-N (green) and negative control (red). 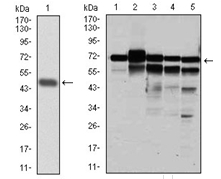 Western blot analysis of RPA1 expression in HEK293T (A); Raw264.7 (B); PC12 (C) whole cell lysates. 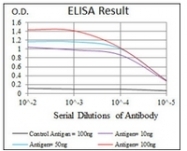 Sample (50 ug of whole cell lysate). A: mouse liver. 7.5% SDS PAGE. TA308716 diluted at 1:1000. 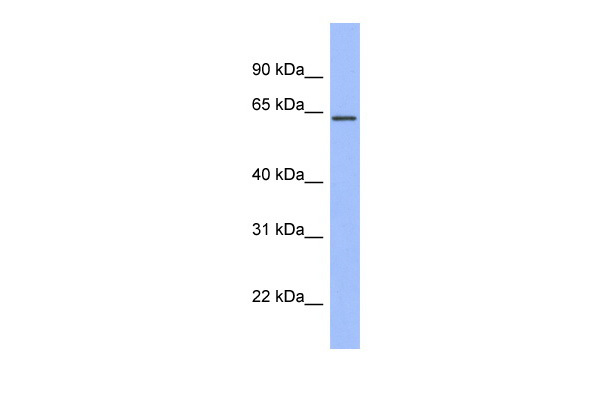 Immunohistochemical analysis of paraffin-embedded Cal27 xenograft, using RPA 70 kDa subunit (TA308716) antibody at 1:100 dilution. 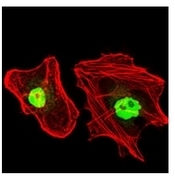 Immunofluorescence analysis of paraformaldehyde-fixed HeLa, using RPA 70 kDa subunit (TA308716) antibody at 1:200 dilution. 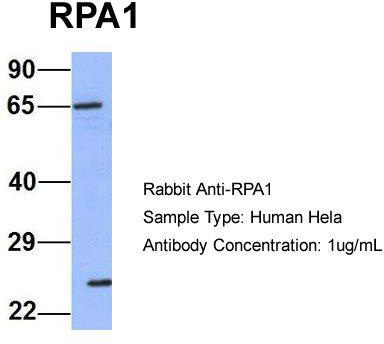 Anti-RPA1 (0.3ug/ml) staining of HeLa lysate (35ug protein in RIPA buffer). Primary incubation was 1 hour. 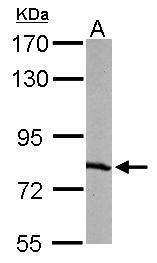 Detected by chemiluminescence. 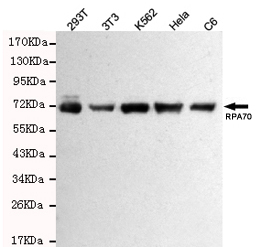 Western blot detection of RPA70 in Hela,A431,MCF7,COS7,HT1080 and K562 cell lysates using RPA70 mouse mAb (1:1000 diluted).Predicted band size:70KDa.Observed band size:70KDa. 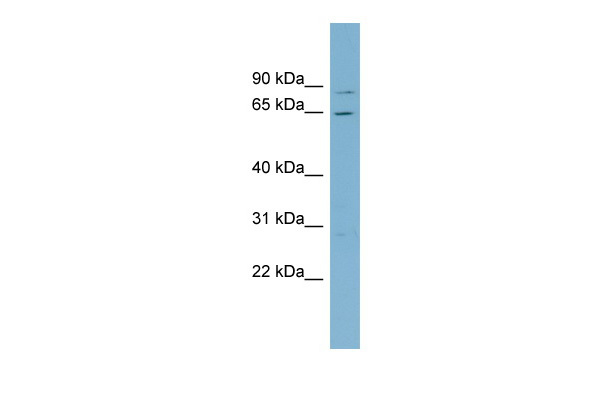 Western blot detection of RPA70 in Hela,293T,C6,3T3 and K562 cell lysates using RPA70 mouse mAb (1:1000 diluted).Predicted band size:70KDa.Observed band size:70KDa. 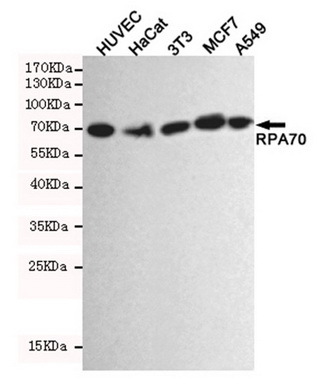 Western blot detection of RPA70 in HUVEC,Hacat,3T3,MCF7 and A549 cell lysates using RPA70 mouse mAb (1:2000 diluted).Predicted band size:70KDa.Observed band size:70KDa. 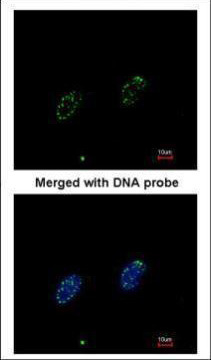 Immunocytochemistry staining of HeLa cells fixed in 1% Paraformaldehyde and using RPA70 mouse mAb (dilution 1:100). 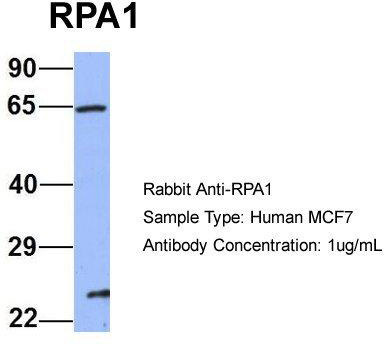 Immunoprecipitation analysis of Hela cell lysates using RPA70 mouse mAb.